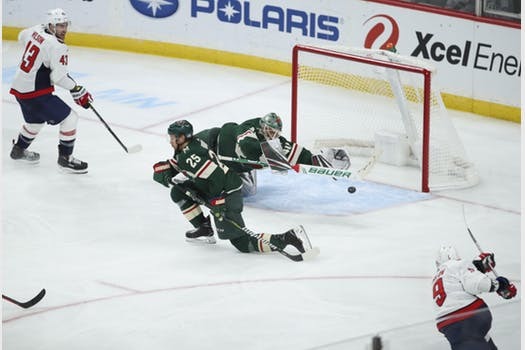 WASHINGTON, D.C. – The race for the second and final wild card berth in the Western Conference got more complicated while the Wild was idle this week, with the Colorado Avalanche taking possession after tying the Arizona Coyotes at 78 points. But the Wild can still jump both teams Friday to regain a playoff spot with a win Friday over the Capitals at Capital One Arena. That the Wild still can control its destiny with just eight games left after falling behind the playoff pace may seem surprising, but this is exactly the position Boudreau expected the team to be in at this juncture of the season. Forward Matt Read joined the Wild on the ice Friday after getting recalled Thursday under emergency conditions. It’s possible, though, his recall becomes the fourth and final recall if he plays and someone is a healthy scratch. Winger Pontus Aberg skated late Friday, along with defenseman Nick Seeler. 8-3-2: Record for the Wild in its last 13 road games. 33: Points for winger Zach Parise on the road, tops on the Wild. 12-4-2: Record for goalie Devan Dubnyk in his last 18 road starts. 74: Points for center Eric Staal in 77 career games vs. the Capitals. 2: Goals and an assist for Washington defenseman Dmitry Orlov in a 5-2 Capitals win over the Wild Nov.13. Washington is leading the Metropolitan Division with 94 points, three ahead of the New York Islanders. The Capitals are coming off an overtime loss to the Tampa Bay Lightning Wednesday. They’ve won eight in a row against the Wild. Captain Alex Ovechkin leads the NHL in goals with 48. He’s two shy of 50, the eighth time in his career he’s reach that plateau.